Here we go! I had almost forgotten to do my June outfit post. 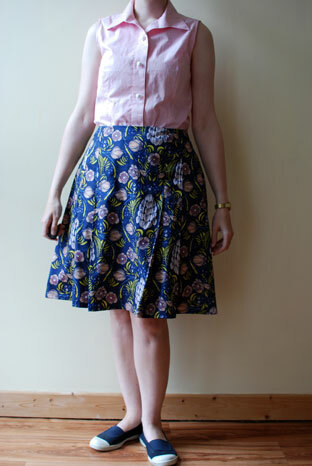 Here is the skirt and blouse I mentioned before. I am so happy with how they both turned out! I was the fortunate recipient of the most wonderful box the other weekend. Let me show you. So, the skirt was very quick and easy. The instructions are for a lapped back zipper but I changed it slightly so that I could put in an invisible zipper at the side. I topstitched the pleats down and, although the instructions call for twill tape at the waistband, I used the facings provided for heavier fabrics for a better finish. The blouse is one I’ve used a number of times now. I like the panelling as well as the fit at the shoulders. I could have taken this in a little but it’s not grave. I faced the armholes with bias binding and trimmed about an inch off the top of the shoulder as outlined by the Grainline tutorial here. 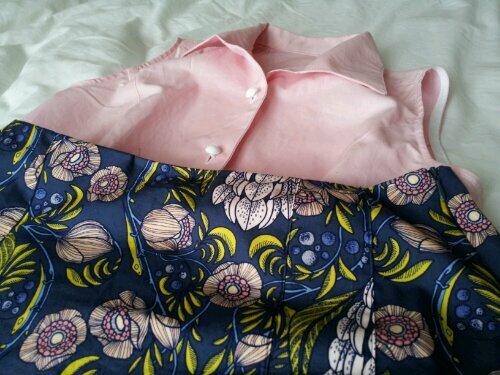 The buttons are from Rubanesque and both fabrics are from Pippa Blue. The blouse fabric is a Kona Cotton solid – it really is quite substantial but I expect it will soften up after a wash or two. The skirt fabric is Art Gallery cotton with beautiful colour saturation and drape. I will definitely be looking up this brand again in the future. What I really like about Pippa Blue is how they manage to stock fabric that’s not easy to find elsewhere. They’re also constantly running a wide range of classes (check them out here) – I’d love to take their patchwork class but the planets have yet to align in order for me to make it to one. I’m off to Switzerland for a music course next week. I’ve been sewing up a few things to bring with me and hopefully I’ll be able to share before I leave! Let’s do the insects first. I found this marvellously soft material in Murphy Sheehy’s a while back. 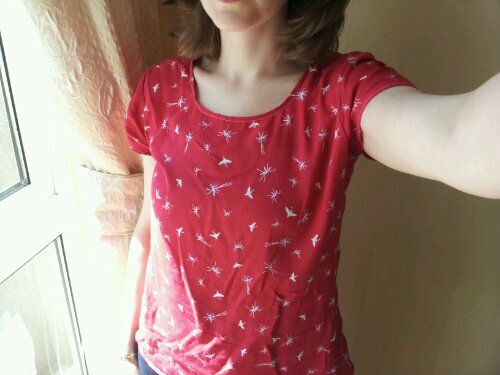 I think I showed as part of my summer sewing plans, with the original intention an Archer shirt. Further examination showed that the fabric not only had alot of drape, but alot of stretch also, so I decided against the shirt. I made another Scout tshirt instead with the same modifications as before. Sorry for phone photos, I’ve been too busy to get out the tripod! This shows the print better. Maybe the fabric would have been a bit weird as a long sleeved shirt! I have been making far, far more than I’m able to keep up with. I made a travel bag (for shoes or ‘delicates’) from a really fun dancing bears fat quarter I had lying around. I finished the outfit I was talking about the weekend before last. I will photo this better and talk more about it as it has a little story attached! I finished my grey Biston shrug, which was like an elephant’s trunk near the end, as well as a lace shawl in the new (well, to me) Silkpaca from Malabrigo. It blocked out so nicely. As for the red zip… I don’t know about you, but sometimes, when I’m buying a zip for something else, I’m inexplicably drawn to zips for other things. Open-ended zips. Boring nylon zips in odd sizes like 15″. Those thick, stumpy jeans zips for trousers. And then, there are the fun zips. Orange, blue, yellow, red…what could I make with a zip like that? I think. That’s how I came home with a red zip. I was thinking, red shorts with a white top and navy shoes. After some thought, I came to the conclusion that a red skirt is far more useful than red shorts (I made a red skirt last summer but rarely wore it for multiple reasons which I will divulge when I finish the New Improved Red Skirt). 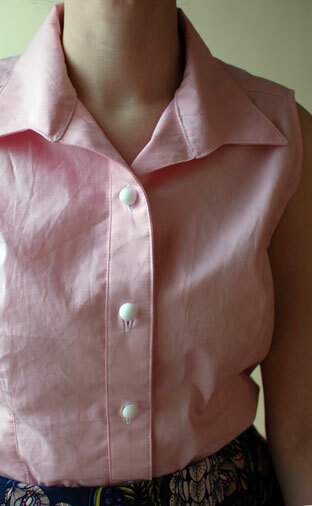 Of course, I took some of that soft, gauzey white shirting and cut out a Laurel blouse to go with it. Then I remembered some fantastic bias binding I have that is white with red cherries! I can’t wait to put the while thing together. There you have it. That is how I fell down the rabbit hole that is buying a red zip. You’ve been warned. After disassembling my bicycle tshirt the other day, I got it in my mind to tweak the Scout pattern as there were some aspects I didn’t like so much. Even cutting it to a size 0, there was too much fabric around the waist and in the sleeve caps. So I took in a bit here, added a bit there, and this is the result. The battery is dead in my camera so we’ll have to make do with phone pics this time, sorry! The fabric I got from Pippa Blue at the K&S show. I think it’s a Robert Kaufmann cotton. It’s not as stiff as your usual quilting cotton so it drapes a bit better. You can see the shape and fit better here. My modifications were these: I’m about a 35″ bust and 28″ waist so I found cutting the recommended size 6 to be way too baggy. That’s the style of it, though, so it depends what you like. I cut a size 0 and then, I took an inch out at each waist side seam (so 4″ overall) and drew in the curve so that the hip measurement stayed the same. I raised the neckline 2″and I took 3/4″ out of the top of the sleeve. I think it worked pretty well. 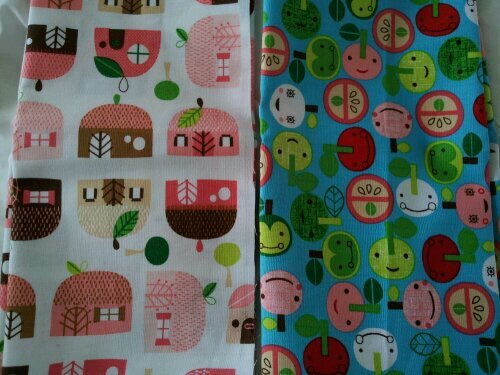 Speaking of Pippa Blue, I was able to visit earlier this week and I picked up these really fantastic fat quarters! They are so fun, I’m not sure what I’ll use them for. Maybe the one on the right for something kitchen-y and the one in the left for a project bag. I also picked up this marvellous navy floral print. I was eyeing it for quite a while online and let me tell you, it is even better in person. I paired it here with a Kona cotton that I bought this time last year for a blouse but never got around to it. I think these go really well together – something like a quarter circle skirt and a sleeveless fitted shirt to tuck into it is what I have in mind. 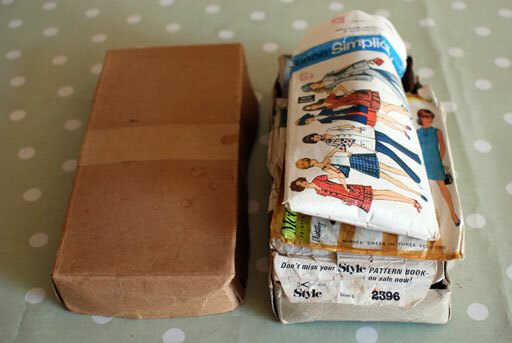 These are both washed and ready to go so I’m hoping to get stuck into both really soon (like, tomorrow). Have a great weekend and hope I have something to show you Monday! You might remember these funny trews. I didn’t know what to make of them at the time but they have since become a home-wear staple. 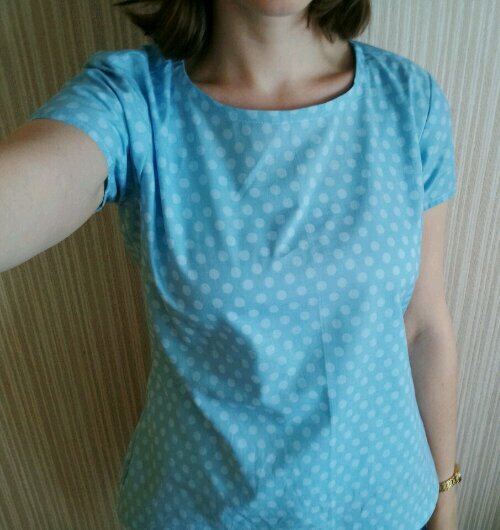 One of the main aims of my summer sewing is to make more casual-yet-respectable clothes to wear at home – clothes I can answer the door in or even teach in. 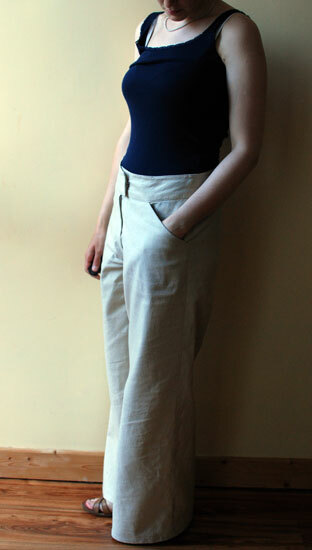 This pants pattern definitely fits into this category but the corduroy is too heavy for summer. I was browsing in Hickey’s one day, came across this stuff and lo! summer pants were born! 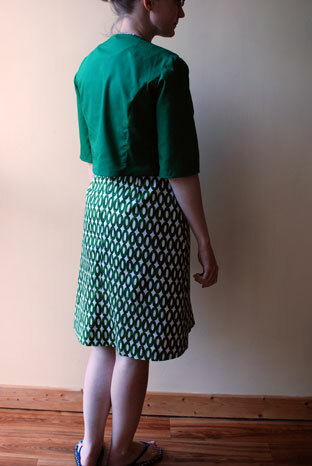 Pattern: Juniper by Colette patterns. I made a 29.5″ leg which is considerably shorter than the pattern. I also adjusted the rise. Basically I drew on my pattern piece the shape I wanted the crotch to have and cut it out. Very high-tech. The other main adjustment I made was to not follow the instructions for the fly. 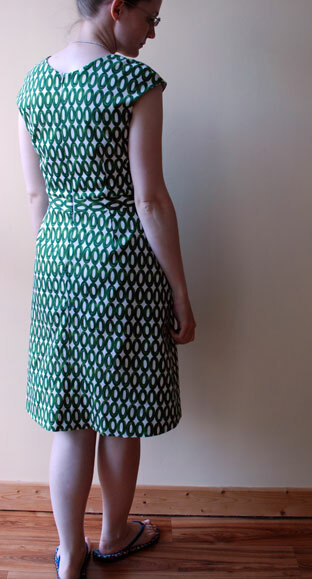 I used the instructions from a Burda pattern instead. What I felt this pattern really lacked was a fly placket on the inside to stop the zip from rubbing against your skin. In hindsight I think it’s a bit strange that it doesn’t have one. At first I thought I had misinterpreted the instructions but no, it doesn’t have one. 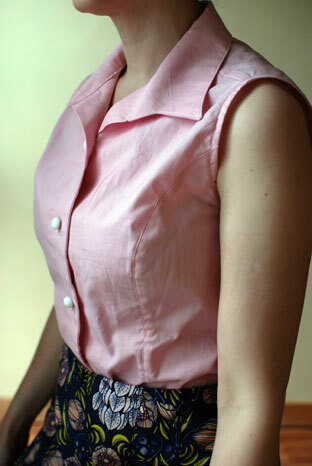 So I cut a placket from the Burda pattern I have and put it in following those instructions. 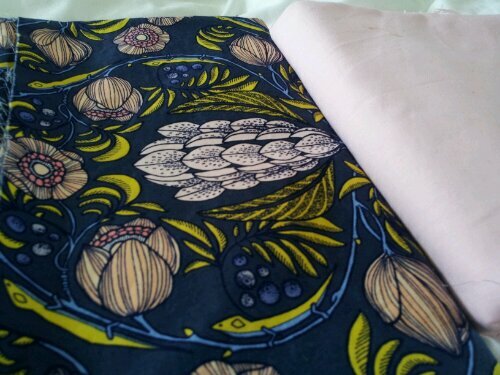 Fabric: Just over 1m of 45% linen/55% cotton fabric – I think I paid about €20 for it and the other notions I already had. I have been wearing these constantly since I finished them as they are wonderfully comfortable. 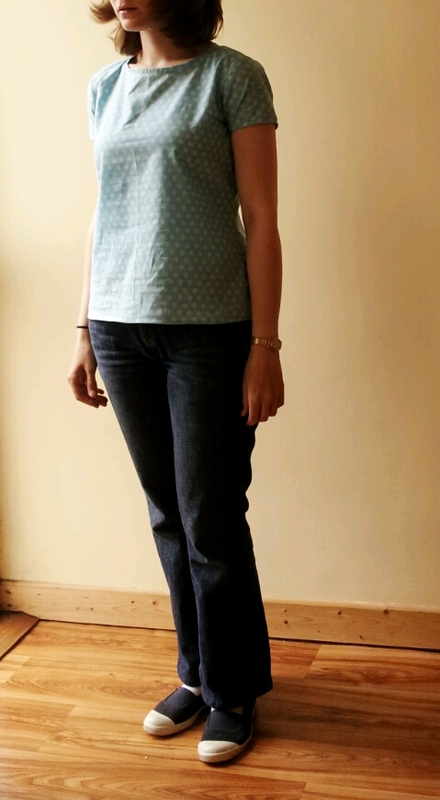 As I have many dark-coloured tops, it goes with many other things I have (like my dotty blouse!). Finally! I finished this before Easter to take to Madeira but never got around to taking photos of it. I wore it to work on Sunday it was that hot. 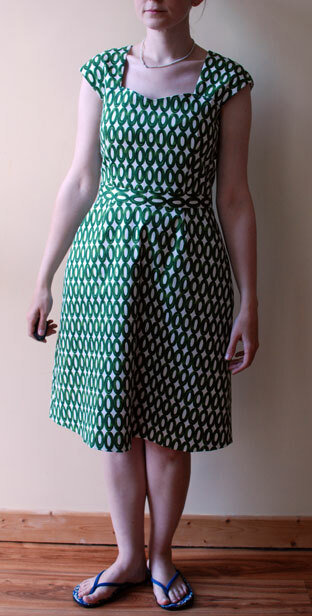 Pattern: Cambie dress from Sewaholic. 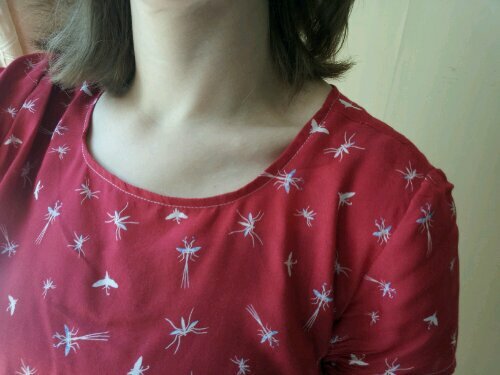 I sewed a size 6 and took a lot off the shoulder straps because of my tiny shoulders. This was an easy adjustment. Fabric: A fabulous cotton with a little bit of stretch in it from Murphy Sheehy’s. This is sort of a bonkers print and it sat in my drawer for a very, very long time. Maybe three years. I’m glad I plucked up the courage to use it. 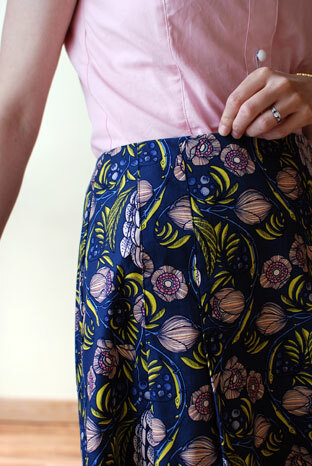 The pattern is very straight forward with lots of nice little details – the skirt part has pockets, for example. I really wanted to make a jacket for it because it is a little bare and we don’t really get weather for dresses like these very much here. This proved to be far more challenging than I expected but I got there in the end. 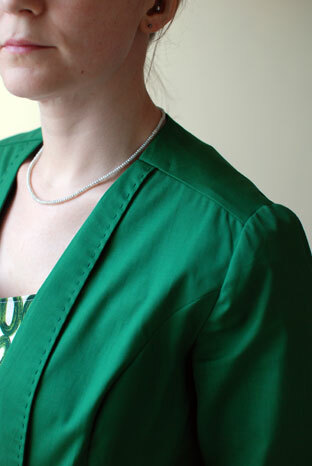 I started off with a Salme jacket pattern but it was a disaster. So, I took the bodice of a blouse that fits me really well and added lapels in the same way the other jacket had them, but in proportion to match the blouse. Cutting it so that the sleeves and body would be the same length was actually the hardest part. At the time, I wasn’t feeling very confident in my top-stitching skills so I worked a slip stitch down the front of the lapels to keep them in place. I used a lovely floral ribbon to face the hems and some black satin bias for the back neckline. I’m so happy with how the outfit turned out and I am much more inclined to consider wearing the dress because I have the jacket. PS: finding the right green to match the print was a PAIN!